Dear Reader, this post is brought to you by a Margot covered in dust and cooking on a camping stove. Do not be fooled. I am NOT camping ( Jerry is still trying to find a glamping site that meets all the family’s criteria. Primrose refuses to wee outdoors and a compost loo counts as en plein air as far as she is concerned)! But you may wonder why a camping stove is gracing my kitchen table, dear Reader? 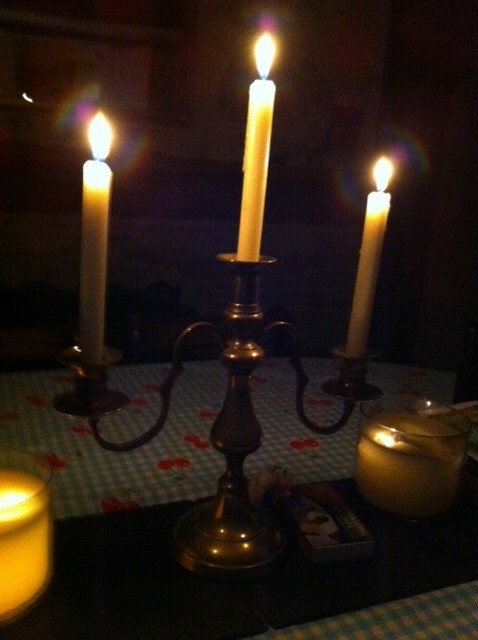 Have we suffered yet another power cut? Have I decided that I can no longer bear to wrestle with the hob that only works if you hit the temperature dial a few times before turning it on? Well….I can report that currently the village is not suffering from its reputation as a blackout black spot so you can cross power cut off the list of explanations. We are renovating our kitchen. Cue a wailing Margot, Primrose constantly moaning about the fact that she can’t have a roast or any fish cakes, Poppy trying to make more noise than the builders and a thankful Jerry who seems to be rather busy at work all of a sudden. I imagine that the office has never seemed such a place of sanctuary to him! Monday last week heralded the first day without the beloved heart of our home. Since we moved to the countryside, we seem to spend ever increasing amounts of time in the kitchen, like they do in The Archers. Not bottle feeding lambs as yet but we have nursed the odd pigeon and a hedgehog back to health in the warmth of the crematorium-style oven. With the smoke alarm constantly our background music, it’s where Jerry and I spend our weekends and the majority of our serious drinking time (tea, gin, wine….mostly gin and wine). My days are spent ‘working’ away on various scribbled bits at the kitchen table too. You might say, dear Reader, that the kitchen is the place we can be found in if you were to let yourself into our home. So our hub is the first room we thought to tackle, having survived our first 8 months of rural life. 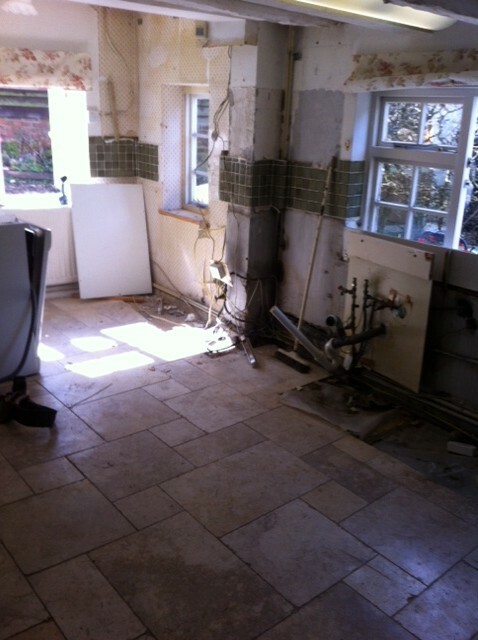 To help you picture the scene, our kitchen of old was a shocker. Not to look at (on the whole) but to work in. 1 set of electric hobs with only 2 functioning plates, 1 cooker (from the late 70s) that cremates all, despite being set on low temp and kitchen wall cabinets which almost meet the worktop thus preventing use of kettle, toaster or chopping board. Green gin palace tiles all over the walls, reminiscent of a Victorian pub loo. A leaky sink that saw me one Sunday in the not too distant past, covered in muck from an exploding u-bend…. I say no more. At that point, it was me or the kitchen. With that in mind, I welcomed the team of builders with open arms to fit me a kitchen I could make marmalade in, dry herbs from the ceiling and leave wet clothes draped on the range. Jerry persuaded them to fit an affordable kitchen instead. All began well and soon the kitchen was a mere shell of its former self. Imagine my delight too when the builders uncovered a hidden window behind a bank of wall cabinets. 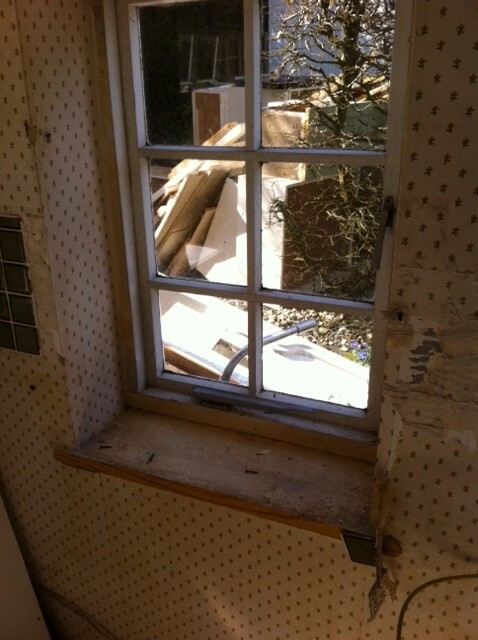 We had been able to see the window from the outside but it had been blocked up years ago. The light that burst through into the usually dark and low beamed kitchen was incredible! A wonderful end to Day 1 in Margot’s kitchen. oh and some scallops and bacon with balsamic vinegar (fish man took pity on me and sold them at a knockdown price from the back of his fish van), in a desperate bid to cheer Jerry and me up on Friday night when the thought of more chicken was too much to bear. To be honest, dear Reader, the rate I am going with the stove, I’m thinking of hosting a new dinner party craze – 3 courses from the camping stove. Could be a winner! 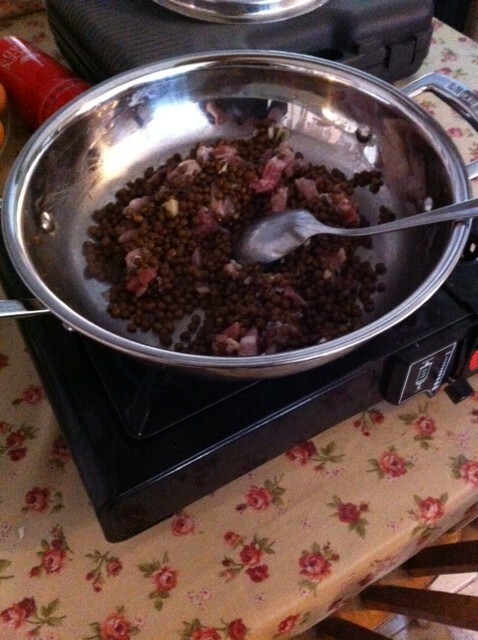 I was even thinking of my own camping stove cookbook – Culinary Tales from Margot’s Stove. It’s not ALL beans you know.. 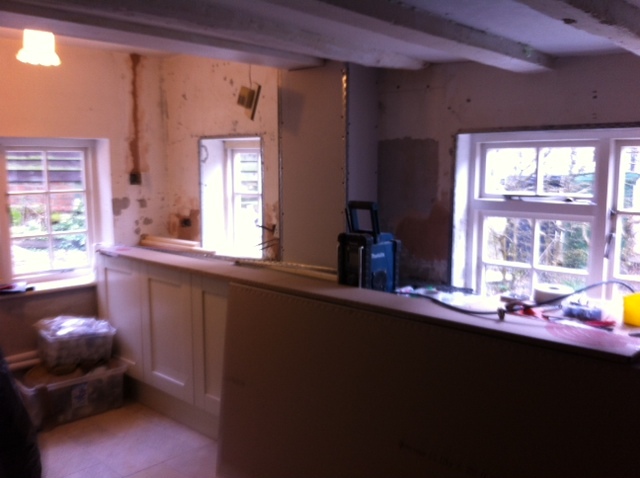 Many cups of ‘white with 2 sugars’ later, the kitchen is making good progress. I have even played agony aunt to Miles, the plasterer, as he negotiated a tricky break up with his long distance girlfriend. Thank goodness I haven’t lost my sense of humour entirely – Thurs night, the builders managed to drive a screw through the electrics, leaving the whole of the ground floor in darkness. When I protested, I was asked if I had candles as the electrician was on another job and couldn’t come back until the following week. This hiccup was only made worse by digging out the bottle of cherished 6 o’clock gin, only to find that it was nearly empty. Darkness for an evening or two, I can live with. Gin, my dear Reader, I cannot! Cabinets going in…progress indeed but STILL so far to go. This entry was posted in Country Sense, The Old Cottage and tagged builders, camping, camping stove, Countryside Kitchen, decorating, Feeding the hordes, foodie, glamping, kitchen renovation, lambs, new kitchen, refurb, The Archers on March 31, 2014 by admin.